I understand that making any alterations to your home can be arduous and stressful; my entire focus is to offer my client’s unmatched service and quality in the installation of new stone projects. Using traditional techniques I install stone tiles for today’s busy lifestyles, to suit both period and modern settings. From consultation to the finishing touches I strive to ensure that all projects undertaken are sympathetic to its surroundings and also highly practical and durable. 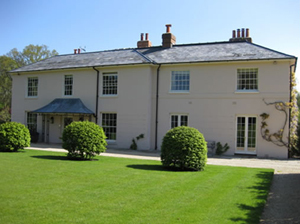 Working in the south east of the UK all work undertaken whether it is in a cosy country cottage, or a large estate is carried out following the core principles of professionalism and attention to detail. I pride myself on delivering exceptional standards of craftsmanship and because of this the majority of my business has come through personal recommendations or repeat business from private client’s, architects, developers and builders. It’s by maintaining and exceeding the standards my customers set for me that I have been privileged to work on some exceptional projects. Each project and design is as individual as each client and whatever your requirements from a traditional look to a contemporary feel I will deliver your project to your specifications on time, so that you can enjoy your stone tiles in confidence for many years to come. Using modern installation techniques all types of requirements whether it is a kitchen floor, entrance hall, wet room, swimming pool surround or terrace I can help you to create your vision. "I can only say how much my husband and I appreciate the attention to detail Peter Cox gave our floor. A positively beautiful job was made of it and everybody admires it greatly. It is very unusual these days to find a master craftsman who produces quality work but this company definitely falls into that category. Even my husband, who is in the building trade himself, says it is a very long time since he has seen such perfect work. Being a pretty fussy person, I felt sure there would be something about which I would need to complain but there wasn't - I was totally happy with the way the work was carried out and the finished result. It really made our kitchen, I cannot thank Peter enough for what was accomplished and would highly recommend him to anybody who needs the services he can provide for work to be done at an extremely high level. We can also honestly say that we consider the price paid reasonable and even go as far as saying exceptional when w take into account the end result.